Fast fashion, the business model that dominates our high streets, relies on a simple premise: selling more for less. Shops shift large quantities of clothes at very cheap prices with high turnover rates as new trends hit the stores every few weeks. It is a model built on exploitation that pushes a global race to the bottom on price. This competition puts factory owners under pressure to offer garments at the lowest cost possible, meaning corners are cut on health and safety and wages are kept at poverty levels. One of the flawed messages of fast fashion is that clothes are disposable: wear a top once or twice, tire of it and throw it away in favour of the latest look. This has direct consequences on the women who make our clothes. Women are at the centre of the fashion industry, both as consumers and as the garment workers who make the clothes. Approximately 80% of garment workers worldwide are women. It is an industry which turns over $1.2 trillion a year worldwide, yet workers can earn as little as $21 a month. Low wages are the inevitable central tenant of fast fashion’s production and consumption model. Many costs concerning manufacture, such as machine running costs, are fixed, so wages become the flexible element and are pushed to poverty levels. Systemic human rights abuses pervade the industry. Long hours, typically 10-14 hours a day six days a week, rising to seven days when deadlines loom, in unsafe conditions where often basic necessities such as access to safe drinking water or the toilet are denied or dangerously restricted. This can have dire implications for pregnant women. Low wages and unaffordable childcare force many women to leave their children with relatives, only seeing their children once or twice a year. By treating our clothes as disposable we are fuelling a system that oppresses and exploits women workers. 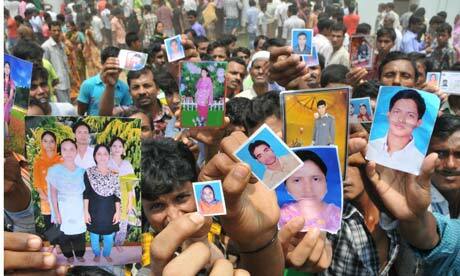 A £4 dress is only a ‘bargain’ because someone somewhere is paying the true price: the garment workers. The fashion industry, churning out endless cheap clothes for ever-changing trends, does so at a human cost. This month marks the three year anniversary of the Ali Enterprises factory fire in Pakistan. It remains the deadliest industrial disaster in Pakistan’s history and is among the world’s worst ever factory fires. More than 250 people died and at least 55 were seriously injured as the clothing factory, supplying jeans for German retailer Kik, burst into flames. Doors were locked from the outside, including all emergency exits, windows had metal bars on them to ‘deter theft’ and workers died, either burnt, suffocated or in some cases boiled alive as hot water flowed from hoses in the basement. As workers tried to escape some were forced to stay by factory managers, concerned with saving the stock over the people. These are horrific details, but behind the glitz of the industry’s advertising images true horror lurks. Kik, as is common in the industry, used a private social auditing firm to carry out safety checks on the factory, and weeks before the fire took place Ali Enterprises was declared safe by an auditing company subcontracted to Social Accountability International. This in itself shows how worthless some social auditing certificates can be. And now, three years on, victims of the fire are still awaiting compensation. Although Kik, with net sales of $1.68billion in 2014, initially paid $1million in immediate relief, they then backed out of negotiations and are still refusing to pay vital long-term compensation, despite signing a legal agreement committing them to do so. This lack of accountability is endemic throughout the garment and shoe industries, and impunity enables human rights abuses to continue. Kik proudly state their low prices are maintained because ‘all our work processes observe the principles of discounting’. It is apparent that this also includes discounting worker’s human rights. It is essential to develop national and international legal frameworks through which to hold brands responsible when people are hurt or die making the cheap clothes they profit from. And brands, who turn profits in the millions and billions, need to pay their workers a living wage. It is a basic human right, as is working without fear for your life. Given the scale of the industry it is easy to feel unsure of how to have an impact and bring about positive change. Emphasis needs to be placed on slowing consumption. As a society we can and should consume less. Resources, including human, are finite. Your voice can also make a difference. Many of our campaigns have been won in part due to collective consumer pressure, such as online petitions calling for brands to be held accountable. Please get involved. Contact brands and ask them what they are doing about implementing a living wage for workers throughout their supply chain. Demand answers to how they ensure freedom of association rights or safety standards are upheld in the factories they source from. It’s up to us all to push brands to make vital changes to ensure no-one need live in poverty for the price of a cheap t-shirt. This opinion piece was first published by the Huffington Post as part of the HuffPost UK Lifestyle series around Sustainable Fashion for the month of September 2015.